« MOCKINGJAY has landed….in my hands! In My Mailbox is hosted by The Story Siren. Thanks Kristi! That third book, when I opened it and saw that it was in Middle English, I panicked! I might as well have been looking at a foreign language! I think I will be buying a modern translation of the Tales to help me along. I graduated college four years ago…I might be a bit rusty. I think I need to look through these books before the first class session. It will be interesting though going to class once a week, writing papers, reading the Tales, but still working with childrens’ books full-time. Totally different mindsets. But we will see how it goes. So expect some posts about grad school….and the Tales. Josh said he would read along with me, which means I will be providing the insight as I learn it myself. Great mailbox! I love Chaucer. My IMM Birthday Edition is here. 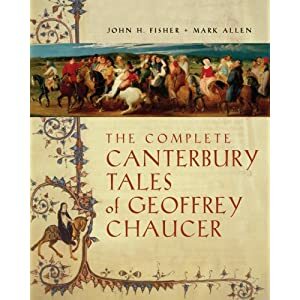 It’s always lovely to see people picking up Chaucer, although I would say not to waste money on a modern English translation as none of them are much good, and Middle English is very easy to pick up quite quickly. Most people find that it helps to read it aloud at first, as often the words sound more similar to modern English than they look (obviously this is no good for reading on the bus). I just finished a postgrad in meideval English literatures this time last year, so if you want to chat about Chaucer or would like any book recommendations then I’d love to help. Ah! I had a teacher who studied Middle English in college and could speak it pretty fluently, and he would do so every now and then. It was crazy. Like so close that you felt you *should* be able to understand, almost — but crazy.